Here is the story of how I began tying flies, and how that lead to the creation of Buggs Fishing. I graduated from college in May of 1996, and didn't have a good idea of what I wanted to do with my life. Our family vacations most summers were to Colorado, some of my fondest memories. So a buddy of mine and I took a trip to Colorado after graduation to fish, hang out, and blow off a little steam. During our trip, I decided to look into working up there, thinking it might be fun. I found a help wanted ad in the Aspen paper for a local fly shop, and found myself in Oxbow Outfitting Company at the base of Aspen Mountain. I instantly knew that this was the job I would move to Colorado for, and told my buddy as much. I got home and began calling the owner every few days, expressing my interest in the position, and finally wore him down. I also figured out that a friend from college lived up there, and she and her husband offered me a place to stay while I got settled in. I'll always be thankful for Hunter and Mark Friedland's hospitality when I moved to Aspen. So there began my 15 month stint at Oxbow, working for Jonathan Feinberg and learning how to fly fish and tying flies. Jonathan was kind enough to let me borrow his fly tying kit, and one of the guys I worked with spent some time teaching me some tying techniques. This next part will sound corny, but it's true. The first time I ever broke out the tying kit was that winter, probably in November or December. There was already lots of snow on the ground. I got the kit out, flipped on the television, and started tying an incredibly ugly dry fly. But I was having fun, and I found a movie to watch while I started teaching myself to tie. That movie was none other than A River Runs Through It, also know as The Movie in the fly fishing industry, as it had brought a significant interest to fly fishing. It remains one of my favorites to this day, as much for the fly fishing aspect as the relationship between the two brothers. I'm a big brother as well, and Jay and I have had out share of ups and downs over the years. I began learning how to tie flies, and one of the guys I worked with helped me learn some useful techniques. Mike Chmura worked in the shop and taught me a lot. On a few occasions, we'd grab our vices and a six-pack and he'd show me how to tie dry flies and nymphs to use on the Fork and the Pan. I got decent enough to catch trout on some simple dries and nymphs I tied without feeling I had disgraced the fish too badly. 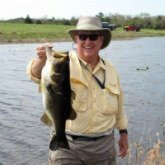 I also began researching bass and saltwater flies. I kind of knew I wouldn't live in the Rockies forever, although it was one of the greatest times of my life. I missed my friends and family in Texas, and would eventually be moving back. So I began tying flies for my bass and saltwater fishing trips, and enjoyed that as well. 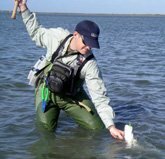 From that first trout, to the perch and bass in local golf course ponds, then to redfish and speckled trout along the coast, catching a fish on a fly I tied myself was an immensely rewarding experience. I was hooked from the beginning, and knew I wanted to continue to tie flies myself to catch fish whenever I went. 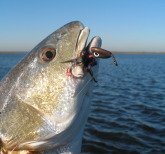 Tying flies and lures adds an extra dimension to your fishing experience. It's a way to think about fishing when you can't go, and also provides a creative outlet.